If you’ve ever dreamt of becoming a dancer then you’ll surely fall in love with the popular ABC television show Dance Academy. This series tells the story of Tara Webster, played by Xenia Goodwin, a young Australian girl who gets the biggest opportunity of her life, to live her dream and study ballet at the best school in the country – the National Academy of Dance. Like her character Tara, Goodwin is living her dream. At only sixteen years old she is an accomplished ballet dancer who is studying fulltime at Tanya Pearson Classical Coaching Academy. She took a chance, auditioned for Dance Academy and won over the casting directors with her natural skill and talent. With a hugely successful first series of Dance Academy now complete, it was wonderful to catch up with the lovely Xenia Goodwin to learn more about this rising star. How long have you been dancing? I’ve been dancing since I was nine and I’m sixteen now, so that’s seven years. I’m primarily a ballet dancer because I grew up doing that. That’s what I had always begged my mum to do. I did contemporary for a really long time as well and now I’m getting a little bit more versatile and have also done flamenco, hip hop, and jazz. How did you win the role of Tara in Dance Academy? I was studying fulltime at Tanya Pearson Classical Coaching Academy and an email came through saying that ABC television were looking for dancers. It was a cattle call audition and I decided to go because my teacher Mrs P. said it would be great experience. I ended up getting a call back which surprised me greatly and then I did the acting workshop and got another call back for a screen test. I did that, and then I got another call back, all the while thinking what is going on?! I don’t even know how to explain it. I just somehow managed to get it. Are you also a trained actor? No, I had never acted a day in my life apart from high school plays. It was really nerve wracking when they gave me a script and said read it on camera. I was thinking, how do I say this line? What does she mean? It’s quite scary, but a really good learning curve. How similar are you to your character Tara? When I first auditioned for the show I was pretty much Tara. I was exactly her, just nothing but ballet, ballet, ballet. I loved ballet and that was it. I love playing the role of Tara because she’s really honest. I feel like she’s such a good person and I aspire to be like that. That’s my favourite thing about her. Also, she’s a little bit dorky and I’m a little bit dorky, so we’re actually quite alike. What has been your favourite episode of Dance Academy? Oh, that’s hard. I think I’d have to say the last episode of the first season (Learning To Fly) which is the end of year performance of the Nutcracker. Tara scores the lead role as Clara and she’s just blown away by that. There are rivalries with other people and she feels like she can’t do the role, but she overcomes this and she finally feels like she is flying. It was such a journey to go through all of Tara’s emotions and it just felt amazing shooting that last scene. Tara had really achieved something by the end of it, and it gave me that same feeling. Who has been an inspiration to you in your dance career? Funnily enough, Tara Morice in the movie Strictly Ballroom. She’s the one who made me want to start dancing when I saw that movie. I used to watch it with my nanna and I thought ‘I just want to dance!’ When I met her on the show I found out that she’s not actually a dancer. She was never a dancer, which just makes me love her more, because in that film she’s absolutely stunning and beautiful, and I idolise her completely. She’s the only person I have ever been star struck over and now I am working with her. Who are some of the choreographers you have worked with on the show? Well my favourite was Sarah Boulter (Contemporary choreographer) who is amazing, amazing, amazing! We had Marko Panzic (SYTYCD top 20 in 2008) for hip hop which I’m not very good at. Lisa O’Dea choreographed some of the ballet in the beginning, and also Stephen Collier who was just brilliant. Ilona Fabiszewski (SYTYCD top 20 in 2010) also choreographed some hip hop and was a wonder to work with. I was so terrible at hip hop and she tried to help me. What do you enjoy most about working on Dance Academy? I have met so many amazing people! Tara Morice is my idol. She’s nothing like her nasty character (Dance Instructor Miss Raine). She is the sweetest and most wonderful woman I’ve ever met. The entire crew, the producers and everybody was so lovely and hardworking. It was really nice to be in that environment. Are you friends with the cast outside of the show? Yes I am, all of them actually. We’re like a family. Dena (playing Abigail Armstrong), Alicia (Kat Karamakov), Tom (Samual Lieberman), Jordan (Christian Reed) and Tim (Ethan Karamakov), are all very different and amazing people! I keep in contact with them a lot. Of course Dena and Alicia live in different states so I don’t see them very often but I still chat to them. The boys live in Sydney so I see them occasionally and it’s really nice. What has been the most difficult part of your role? There were scenes where I had to dance in time to the music and also talk at the same time. I must be really uncoordinated because I can’t do both – dance and talk! I would either forget the steps or forget my lines. It was so hard! Have you ever had an embarrassing moment on set? I knew you were going to ask this question! I’ve had a few. The worst was on one of the first days of filming. I was so new and wide eyed and I had no idea what I was doing. I didn’t realise the walls on set weren’t real, and you can’t lean on a wall when it’s not real! It could have been disastrous had someone not caught it because I almost knocked the entire set down. I don’t think the producers ever found out about that! What advice do you have for young aspiring dancers? I just have to say go for it! It’s really hard especially when all you hear is negative comments and criticism. You have to think that when your teachers are correcting you and being hard on you that they are actually only doing that because they see potential in you. So be happy if you get corrected because that means they want something more from you, which is a good thing. ABC TV and Dance Academy are giving away a DVD box set plus 5 Dance Academy CDs to lucky Dance Informa readers! Click here to enter! I have a Groodle too. His name’s Brewster. He’s crazy but adorable. Xenia/Tara you are so LUCKY to dance with Ethan and Christian – they are SO HOT! SO jealous. Hey Xeina I think you are a great ballet dancer. I do ballet I am 8. 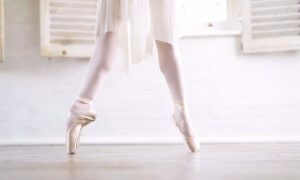 I do ballet 4 and going to do pointe. Fabulous show great way to show students how hard work will get them where they want to b.e I particularly found the way they handle they eating disorders very impressive. I REALLY LOVE WATCHING DANCE ACADEMY IT IS ONE OF MY FAVE TV SHOWS. I HAVE THE FIRST SERIES ON DVD AND I ALWAYS WATCH THEM I CANT WAIT FOR THE SECOND SERIES TO COME OUT. Omg I love dance academy!! I have watched all the episodes one million times. No more. Anyway I love your show. It’s so amazing to hear all these things about you. You are a truly amazing dancer and actor. My favourite scene was when you were dancing at the start of I think ep 3 when Christian and Aaron were running from the police. That was awesome. can’t wait for the second series!!! I’m like Tara a. It too I think. Anyway, I’ll stop now.